Is The Media's Need For "Canada's Trump" Making Leitch A Shoe-In? Is The Media’s Need For “Canada’s Trump” Making Leitch A Shoe-In? For one day this week, Kellie Leitch wasn’t the focus of press coverage in the Conservative leadership race. Her rival Maxime Bernier captured some headlines with a plan to drastically change the CBC’s mandate and funding model, removing ads and slashing funding. Then Leitch jumped on the same topic, and trumped Bernier’s radical plan with a downright extreme one. The press took the bait. Stories quickly appeared from the Toronto Star, iPolitics, the National Post, and The Canadian Press. It’s part of a running pattern for a candidate who’s stealing tone, tactics and even tweet style from the victorious Donald Trump campaign. The similarities are hard to ignore. The Liberal decision to fund UNRWA, a group with alleged ties to terrorist organization Hamas, is outrageous and dangerous. Bad judgement! Here’s Leitch being belligerent with the press, like Trump. But Leitch’s most successful media tactic is unique to Canada, and she has exploited a major vulnerability in our media to catapult her once-faltering candidacy. Google Trends* shows searches for Leitch spiked well above of her rivals as soon as she explicitly linked herself to Trump on election day. While searches for her name have dropped off slightly in the intervening weeks, her name is still being searched about 10 times more on average than Lisa Raitt’s. Google searches for the top five candidates over the last month. Searches for Leitch, in blue, show a sharp peak just after election day in the U.S. This leads to a question: After watching the American news media fuel Trump’s ascent with nonstop free coverage, are we making the same mistake in Canada? Since sending a notice to her supporters about how excited she was that Trump was elected, Leitch’s campaign has garnered daily coverage. She’s getting the benefit of news stories, column piled on column. Most of the coverage trends negative, but that doesn’t seem to matter because Leitch has positioned herself as the anti-elite candidate. It doesn’t matter she’s a surgeon with an MBA who used to sit in cabinet any more than it matters that Trump flies around in a 757 with his name on it. This isn’t about reality, it’s about image and it’s about name recognition — thanks to two weeks of constant press, Leitch now has it. Leitch has used every opportunity to link herself with the U.S. president-elect. She quickly put out a news release comparing her vision to Trump’s on election night. Leitch explicitly said she shared some of his values at a recent leadership debate. It’s unlikely the press in Canada actually want to create our own Trump, but our storytelling reflexes are leading us down that path. Of course, Leitch has not simply been mimicking Trump’s style. She has also been aping his policies — policies Canadians arguably rejected last election. When their prospects dimmed in the last federal election, the Conservatives turned to thinly veiled anti-Muslim xenophobia. The party got thumped for it, and Justin Trudeau’s Liberals got a majority. Canadian voters explicitly rejected this sort of politicking by a tired government. Leitch made a tearful apology for being a part of the “barbaric cultural practices” hotline launch, set up so neighbours could snitch on the “cultural practices” of their implicitly Muslim neighbours. Her contrition was soon abandoned. Leitch has made screening immigrants for ill-defined “Canadian values” the central plank of her campaign. Media outlets began polling on whether her values pitch was working (notably using her terminology to do so) and they found many Canadians approved of the idea. This, in turn, fed back into Leitch’s campaign as proof she was on the right direction. 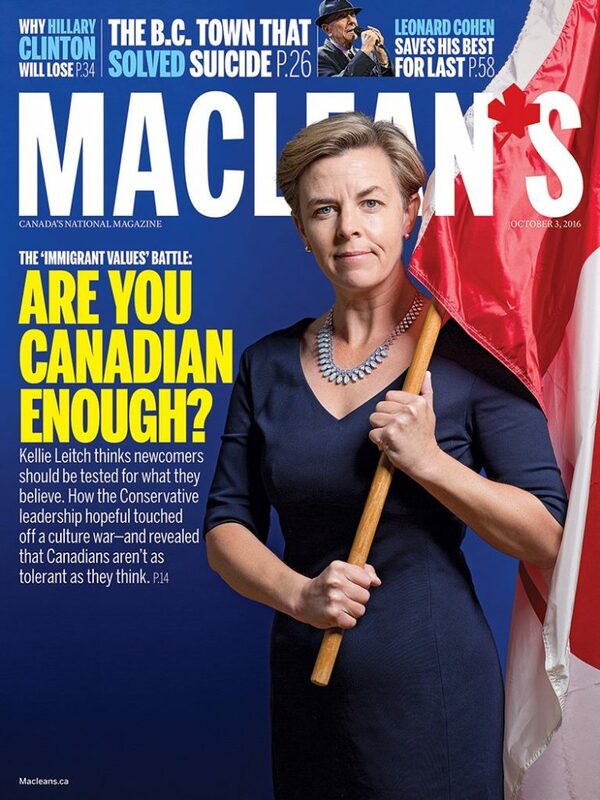 The press then fed on this, and Leitch landed on the cover of Maclean’s, defiantly holding a Maple Leaf. The cover of the Maclean’s Magazine Oct. 3 Issue. Of course, the coverage is often negative. But there’s so much of it! Leitch has been condemned in editorials in the Toronto Star and the Globe and Mail (and praised by editorials in the Toronto Sun). Her pitch has been discussed at length in columns in the National Post, Ottawa Citizen, and CBC. By way of contrast, Leitch’s opponent Michael Chong only seems to get wide coverage when he’s attacking Leitch or taking part in scheduled debates. A quick search for “Leitch” and “Trump” since the U.S. election on the media-monitoring website Infomart, and you get nearly 300 hits for stories in newspapers from around the country. And those are just the articles making the direct link between the two. Search the same website for “Maxime Bernier” — another of the leading Tory candidates, polling eight points behind Leitch — and you get 50 results over the same period. But it’s hard to measure true support of candidates in the leadership. There are polls that show Leitch leading the pack, but there are a dozen people looking to win the top job. In the latest poll, nearly as many people are undecided as they are for Leitch. And that assumes the polls are at all trustworthy to begin with. Our confidence in polling is lower than ever, but Leitch’s numbers are showing a clearly upward trend. As she gains more attention and recognition, her numbers are following suit. Kellie Leitch is on the path to victory. If she wins, the press will have played a major role in promoting her name and legitimizing her, even while decrying her. The possibility of simply ignoring a once-fringe candidate with ideas rejected by most Canadians, has already passed.